In the third installment of his Jack Chamberlain series, James F. Timmins presents a compelling story about HomeGrown terrorism. PORTLAND, Maine - Aug. 2, 2016 - PRLog -- In his timely new novel, James F. Timmins brings the fear of homegrown terrorism to life. 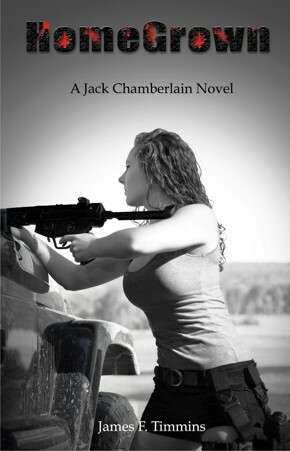 The third installment of his Jack Chamberlain series, picks up where fans left Jack, fresh off the case of his life in Boston. Now in Gettysburg with Claire Sanchez for a historic reenactment, he finds himself on the front lines when the reenactment turns into a national tragedy. Thrust into the case, Jack must work with local police and the FBI to identify, locate and catch a terrorist cell so insidious that they have been operating in plain sight. The consequences if he fails are unfathomable, but even success may not be able to undo the damage already caused. This fast moving, character driven story brings readers to the front lines in the fight against home grown domestic terrorism. With an eye for detail, Timmins switches points of view throughout the book, giving the reader a glimpse into the minds of members of law enforcement, and terrorists. HomeGrown, and the other Jack Chamberlain books in the series, Three Card Monte and Marketable are available on Amazon.